Warning: this post contains some abysmal house plans drawn in MS Paint and no pretty images whatsoever. If precision and neatness are your thing, best not to proceed any further! In my last kitchen post I told you all about our plans to change the layout of our house downstairs and add a small extension to create a beautiful family kitchen-diner. Of course, it hasn’t all gone quite to plan. I am not sure why I expected it to – if there is one thing I have learned during our renovations of the house so far, it is that the best-laid plans can go awry when dealing with a house that is over two centuries old (e.g. our bathroom floor disaster). Heck – they can go wrong when dealing with one that is 20 years old…you just never know what you might find under floorboards or behind plaster! So it is pretty crucial to have a flexible renovation plan when doing major works, or at least to be open to suggestions from your builder or architect that might save you a fortune. So, here’s how we abandoned Plan A in favour of Plan B, and then changed that, and at the moment we’re on C I think, but who knows if we will need a new plan before it’s all over! Our plan initially was to knock down the lean-to on the back of one side of the house, and extend the existing kitchen across the tiny pointless courtyard gap and replace the lean-to, so that we had one long room at the back of the house for a kitchen-utility room (with big skylights in the extension to let the light in to an otherwise dark room), and then knock through into the dining room to create an open-plan kitchen diner. We had estimated our budget for the extension, which turned out to be exactly what we were quoted for the building work. So far, so good. However, the architect and builders were adamant that the existing garden wall behind the house was not sufficiently retaining for the new build and wouldn’t do the job without first building a new one, which would involve substantial earth-works in the garden due to the steep hillside location, all of which would have to be done by hand because of the lack of access for machinery. So the reasonable quote became a sum four times larger, that we didn’t have, and that would risk going over the ceiling of what the house could be worth. All this for an extra 3.5 square metres of space. Well, we’re not crazy. The sum quoted to us for removing the redundant second staircase which comes up under the bathroom was also astronomical as the stone stairs are tied into the side wall of the house which supports the roof, so we would have needed to prop up the entire side of the house and rebuild it. For an extra metre’s width of kitchen. Not going to happen. Seeing my perfect family kitchen dreams disappearing, I knew I had to get creative with what we have and the obvious solution was to simply turn the existing dining room into a larger kitchen. 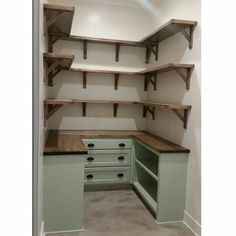 I wanted to add a door in between the existing kitchen (which would become the utility room) to enable easy access to there without going through the living room. It would have involved moving the door to the cellar back a little, and knocking through the wall there, but nothing of major difficulty. However, without the extra space of an extension or the metre width gained from the staircase, removing the large chimney breast in the dining room became crucial, as there just wouldn’t have been space for a kitchen otherwise. This of course meant removing it above in our bedroom, and up through the attic onto the roof. Meaning the entire house would be getting involved in the project and there would be even more dust everywhere! The builder was happy with this job, and quoted us something reasonable (it being much cheaper not to move the front door), leaving us some money left over for actually improving our kitchen in the process, so I was happy. At least until I started to draw some floorplans. 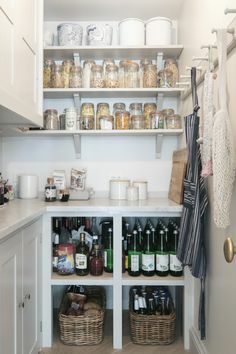 I then realised that with a door at every corner of the kitchen, we would have very limited space for units and actually what seemed a big space just wouldn’t be very functional. So a door had to go. In my ideal world the utility would be off of the kitchen, but it just wasn’t going to work. For the sake of walking through the living room, I could live with getting rid of the proposed new door in the corner, giving us a decent run of units around the corner on that side of the kitchen, and therefore almost enough space. 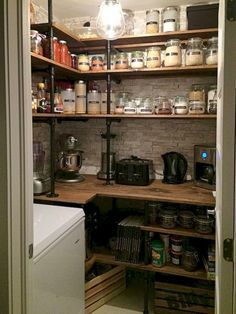 There still wasn’t enough room for storage though (I have a lot of pots and pans, crockery, cookbooks, and ingredients, not to mention gadgets and small appliances that don’t get used all the time, but are invaluable when I do use them), so I started thinking about how we could create a pantry. 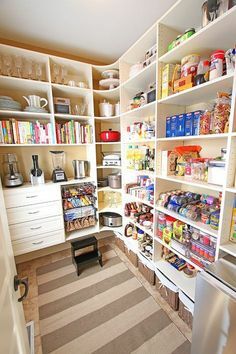 Given that we couldn’t take out the old stairs, there was still an odd cupboard in front of the front door which housed shoes etc, which I thought could perhaps be a pantry. However I really didn’t want people trekking in with filthy boots into the same space where I store my baking supplies! Ever since we moved in we both have wanted to move the front door to the middle of the house (in front of the staircase we do use) to add symmetry and make it feel much more like one house rather than two stuck together. 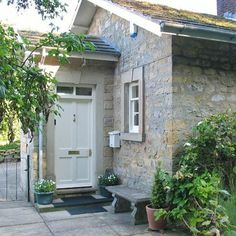 I realised if we moved the front door, we could brick up the old one, and use the tiny entrance porch as my pantry. That meant though that the dogs would be coming in and out of the front door with filthy paws after winter walks, straight into the carpeted living room, not ideal. So I decided we could turn the existing downstairs loo into a boot room to store all our coats and winter gear and various boots and wellies, and to be a perfect place to dry off the dogs when they were filthy. So we needed an entrance to this boot room from the side passage. So I asked the builder to install a little stable door in the wall there for us! It is also right next to a drain outside, so we can add an outside tap to hose off any particularly heinous mud before even letting them inside the house – so practical! So, that’s plan C, and the one we instructed our builder on shortly after Christmas, but we had to wait for him to finish a previous job rebuilding a local cricket club. Little did we know he wouldn’t be able to start until after Easter! But he assured me there was plenty of time to finish the work well before the baby arrived…. As you can see, we have been through multiple incarnations of what this project could look like, guided at each turn by cost and feasibility, but above all, practicality. We want a family home that works, and that won’t bankrupt us in the process. This is why it is so crucial to be flexible at the planning stage – you can end up with a much better project in terms of outcome and expense (even if it isn’t what you originally envisaged) if you can keep an open mind.